No other sheet-fed inkjet printer can print as fast as the HC5500. At 120* pages per minute in full color, the HC5500's print speed can't be beat by any other inkjet printer. With the HC5500, you can print in brilliant full color for almost the same cost per copy as black and white on other printers. Plus, the HC5500 boasts the world's fastest print speed-120 ppm-for full-color inkjet printers, as well as an incredibly low running cost. The HC5500 prints for an amazingly low 3 -* per page in full color. Monthly volumes up to 500,000 provide a fast return on investment, whether in a facilities management site, central reproduction department, or as a departmental or networked office printer. FORCEJET technology is found exclusively in the RISO's inket product line. RISO built its inkjet technology on the proven track record of the duplicator chassis, but instead of individual ink cylinders printing static information, RISO used heavy-duty inkjet print heads capable of creating full color, variable images. RISO HC Series high-speed inkjet printers employ 24 in-line piezo drop-on-demand print heads. Each of the four colors (cyan, magenta, yellow, and black) has six print heads in a row imaging the page. Piezo print heads use vibration to create ink droplets. The print heads are stationary and the paper passes underneath them. As the paper moves beneath the print heads the print heads lay down the individual colors that make up the four-color print. In the HC5500, the order of colors printed is cyan, black, magenta, then yellow. For the HC5000 the order is black, cyan, magenta , then yellow (as shown below). The fixed position of the print head makes possible the high printing speeds found in the HC Series inkjet printers, and it also results in a longer life span for the equipment. Thermal inkjet print heads are found in almost all desktop inkjet printers and many in-line mail addressing systems. Unlike piezo systems, thermal inkjet printers use an electrical charge to heat the ink inside the print cartridge to form ink droplets. The print head shuttles back and forth across the page as it applies ink to paper. (See below.) As a result, this technology is much slower and far less reliable, and its cost-per-page is substantially higher than RISO's FORCEJET technology. Thermal inkjet printers also have a much shorter expected life span. Commercial-grade inkjet printers using shuttle head technology are available that offer higher print speeds, but they are still much slower than the HC. Serial or dot matrix printers are commonly found in data processing centers, medical offices, shipping and receiving docks, and other locations where continuous and multi-part forms are used. Since these printers are impact-based (meaning an ink ribbon is struck against the paper) they are well-suited to printing multi-part carbon copies. Inkjet printers are generally less expensive to acquire and use than toner-based devices. The heat used by toner-based printers to fuse applied toner and fix it to the page causes these machines to be more vulnerable to failure and leads to more downtime, higher service costs, and shorter life spans. Toner is also incompatible with plastic and many paper types, and it is prone to cracking and flaking when folded or put through finishing devices such as postal sorting equipment. Their heat requirements also make toner-based printers far less energy-efficient than inkjet devices. Variable Data Printing, or VDP, is a form of on-demand printing in which elements such as text, graphics, and images can be changed from one printed piece to the next using information from a database. Today's VDP applications go far beyond the laser-personalized letters, invoices, and customer statements of recent decades. It is now possible to customize a variety of documents from sales brochures to training handouts to fit the needs, interests, and preferences of individual customers, employees, or members. VDP has been shown to boost the effectiveness of printed output whether it's measured: by response rates, readership, ROI, or customer satisfaction. 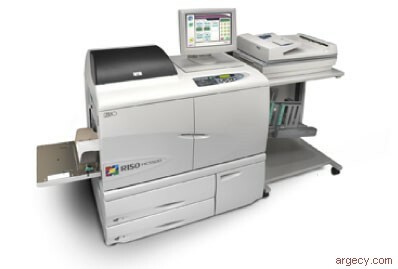 The RISO HC Series inkjet printers produce variable output in color easily and economically. Whether each page is completely different or a simple mail merge is used just to place a name and address on a page, postcard or envelope, an HC Series inkjet printer can handle a wide array of variable data print jobs. RISO HC Series high-speed inkjet printers make great entry-level systems for commercial printers considering expansion into mailing services. Printers can still turn a profit on the unit with every day print jobs while they prospect for mailing applications. A dedicated mailing system will tie up valuable resources until the printer finds enough business for it to break even. The same can be said for the mail house that may want to start offering print services. HC Series inkjet printers allow the mailing services businesses to continue running their applications on it while prospecting for printing customers. But you don't have to be a commercial printer or mail house manager to take advantage of the HC Series printers' VDP capabilities. The HC Series inkjet printers do not require a skilled operator, so practically any office can produce personalized and customized direct mail, newsletters, sales collateral, training kits, assessment tests, and more. Both machines are also tailor-made for traditional back office functions such as invoicing and printing customer statements. There are two main operational modes to VDP. In one methodology, the document template and the variable information are both sent to the press, and the raster image processor (RIP) combines the two to produce each unique document. The other methodology is to combine the static and variable elements prior to printing, using specialized VDP software applications. These applications produce an optimized print stream, such as PostScript, which organize the print stream efficiently so that the static elements are only processed once by the RIP. RISO offers users a choice of RIP. The Post Script RIP is required if printing from a Macintosh computer. Commercial, in-plant and other users that will be printing out of Post Script applications such as Adobe InDesign, Quark, and Page Maker should opt for the Post Script RIP. General office users printing from Microsoft applications should select the GDI RIP.